One of my favorite parts about Friday night is the anticipation of Saturday morning, and our delicious, lazy weekend ritual. We sleep a little late, and somewhere a bit before nine I might slip out of bed, turn the oven to preheat, and pull something out of the freezer to defrost. Then back to bed until the oven beeps, at which point we get up and Michael takes care of the coffee and I take care of the food. We recently got a Chemex coffee maker (though "maker" doesn't seem like quite the most appropriate word, since it doesn't actually make the coffee, it just holds it while you do the work) and Michael has been getting his coffee making down to a science. 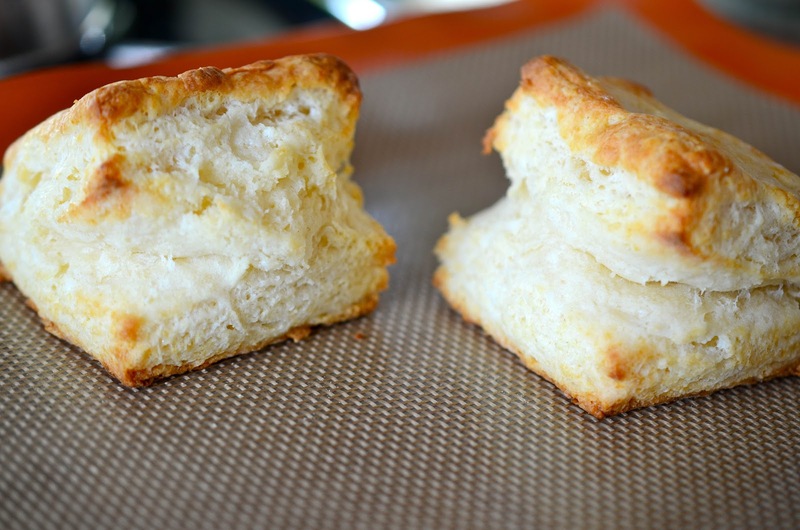 And if it's a really good week, then I've already prepared a batch of something that can be easily frozen raw, then pulled out in two portions at a time to be baked fresh - like scones, cinnamon buns, slightly different cinnamon buns, or more recently, these buttermilk biscuits. I'm really proud of these biscuits. I've been experimenting with various biscuit recipes for a while, trying to come up with a light, flaky, soft, tender, buttermilky mouthful of goodness that can easily be split in half and spread with apricot jam or honey. Peter Reinhart's recipe gave me the folding technique to get the flaky layers. I found that swapping out cake flour for some of the all-purpose flour made them all the more tender. I also decided against using round cookie-cutters, because in my opinion that's a criminal waste of biscuit dough. I cook them at a lower temperature than a lot of recipes suggest, not only because the higher temperature sets of our smoke alarms, which definitely kills the weekend morning mood, but also because I think they brown more evenly. And I made the preparation process simple enough (it all happens in the food processor and then on the counter) that you could even make them on Saturday morning in barely more time than it would take to make the coffee. I highly recommend weighing the flour, if you have a scale - it will allow you to be much more precise. If you plan to bake your biscuits right away, preheat the oven to 425 degrees and line a baking sheet with parchment paper. Put the all-purpose flour, cake flour, sugar, baking powder, baking soda, and salt in a food processor, and pulse two or three times to combine. Take the butter out of the refrigerator and cut it into very small pieces - the easiest way to do this is to divide it into four long pieces by making two perpendicular lengthwise slices, then setting it down and cutting chunks of about a half inch. 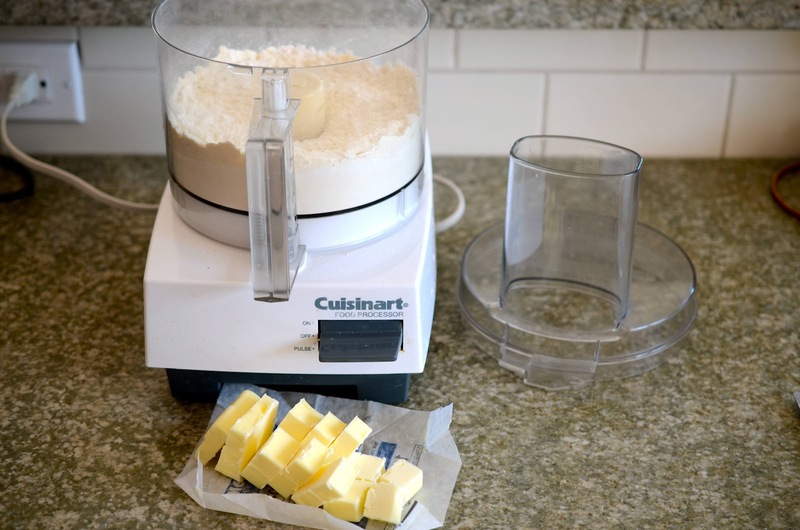 Distribute the butter pieces across the flour mixture in the food processor. Pulse the food processor about 5 times, each pulse lasting about one second, until the butter has been reduced to rough, pea-sized chunks. Pour in the buttermilk and turn on the food processor until the dough collects into a ball. Put the dough onto a floured work surface. Sprinkle a bit of flour on top and with your hands, pat it down into a rectangle about three-quarters of an inch thick (you don't need to be too precise, just be sure you have enough surface area to carry out the next step). Fold the right one third of the dough over the middle third, then fold the left third over that, like folding a man's wallet. 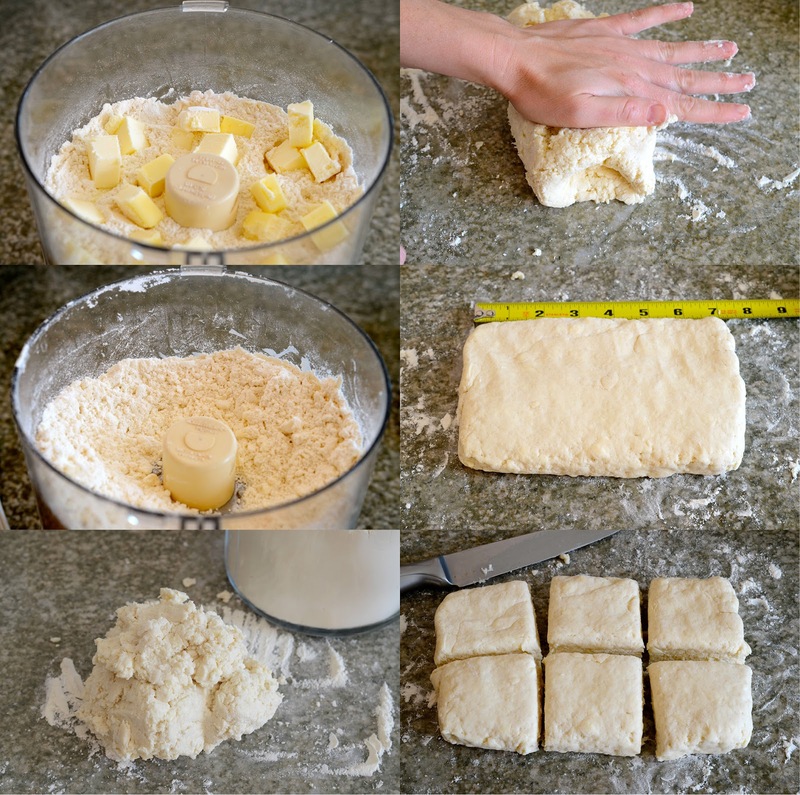 Then pat the dough again into a rectangle as before, and do the tri-fold again. Repeat this process one more time, sprinkling a little flour on top each time and moving the dough to make sure it doesn't stick to the counter. Then pat the dough into a rectangle about 5x7 inches. Use a sharp knife to cut it in half lengthwise, then make two vertical slices to cut six biscuits. Bake for 15 minutes, or until the biscuits are golden brown on top and have risen to about twice their size. If you want to freeze biscuits for later, set them on a baking sheet and put the baking sheet in the freezer for about an hour. Then remove the biscuits and put them in a plastic bag, and return them to the freezer. When you're ready to bake frozen biscuits, if you don't have time to defrost them just add about two minutes to the total baking time. Looks yummy! I think I'll put these on my vacation baking list. Saw this on Pinterest and repinned, thanks for sharing! Looks so yummy! We definitively have to try it. 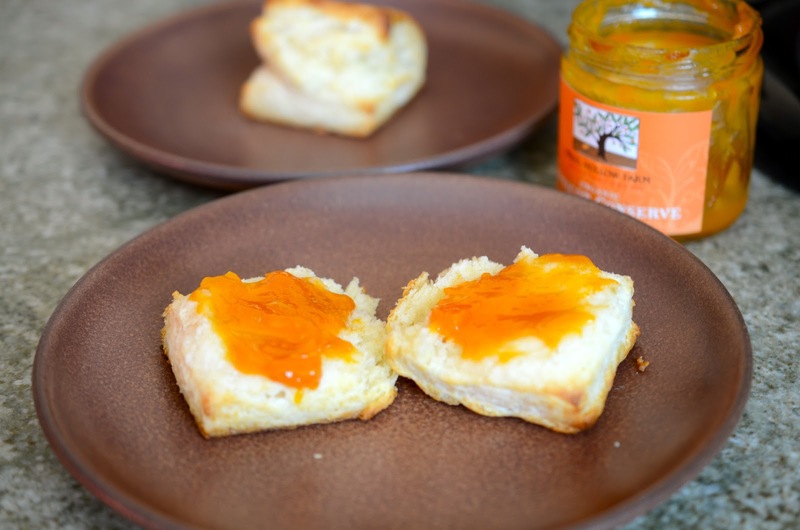 We'll miss for sure the Berkeley Farmer's market favorite apricot preserve. Too bad that we can't find it in France.